​Do I need to add the book to the fundraising page? I’m supposed to add the book my child’s finished reading to the classroom’s fundraising page. Where can I find my Charitable Tax Receipt? Can I ask someone who isn't a local to donate? Why are are the kids participating in this read-a-thon? We missed a reading - what can we do? We lost the log sheet. Can I get another copy? Do I need to add the book to the fundraising page? When the books that are read are posted to the fundraising page, the information is shared with the supporters that have joined the fundraising page. It's a neat feature that keeps the supporters informed of the activity that is going on, and the effort the students are putting in. The submission can be done by anybody (e.g. teacher, parent, tech-savvy child with an adult's permission). Although there is no penalty if the book isn't submitted online, doing so would help create more buzz for the fundraiser. It might even give your child a good lead on what book to read next! How do I record the book my child has read on the fundraising page? Recording a book on the fundraising page: I already have a Chimp account? What should I do? ​How do I get my Charitable Tax Receipt? If you created a Chimp account while you donated, then you can log into your account, and from the top right drop down menu, select "Tax Receipts"
If you did not create a Chimp account, then the tax receipt would have been sent to your email address. Check your spam folder, or contact Chimp's Client Success team to have another one sent to you. We are trying to avoid having to handle and manage cash, and would prefer to take donations through the online website. The fundraising site provides the charitable donation tax receipting, which simplifies things immensely for the PAC. However, if you do not require a tax receipt, and are not able to give online, you can put the donation into into an envelope labelled with ‘PAC Read-a-thon donation’ with your child’s name and division in your child’s planner, or in the PAC mailbox near the school's office. Note that the cash donations will not be added to the tally until the end of the fundraiser. Can I ask people who don’t live locally to donate? Absolutely! Send them the fundraising page url, and they can donate online. Note that the charitable tax receipt is for the Canadian jurisdiction, but the donation can be given from any donor that has a credit card. We are raising money for the school’s library which every student spends time at, and borrows books from. The funding from the school district has drastically been cut, and it’s become hard to repair and replace the books. The 550 students at the school take out about 1500 books from the library every week, so they get some bumps and bruises. Raising $12,000 should help support the library for about 4 years, and continue to help enrich the children’s learning environment. Chimp, a portmanteau for CHaritable IMPact, is a social fundraising site that our PAC read-a-thon co-ordinator, Jen Sing, works at as a software developer. They are an established Charitable Marketplace which has helped donors give 80 million dollars to Charities. Every Charity registered with the CRA is available on the site. 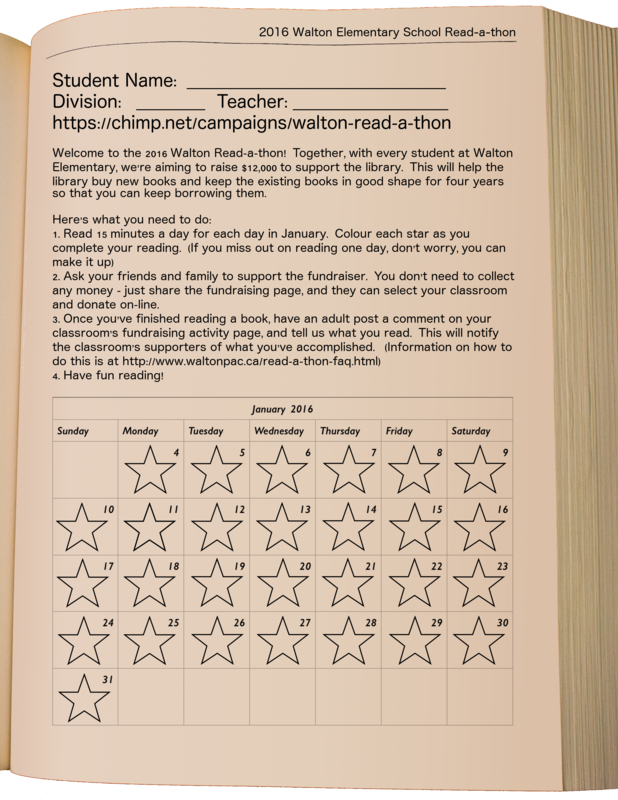 All money donated to the Walton read-a-thon fundraiser will be delivered to the Walton PAC via SD43, a qualified donee. Chimp recovers the processing costs (the credit card companies charge 2.3% + 0.30 on every transaction), and does not charge any additional fees. ﻿My child missed reading for a day, what can we do? Not a problem! This read-a-thon is about having fun reading :) If you can make up the 15 minutes on a future day, then please do so and colour in the missing star. We lost the log sheet! Can I get another copy? No problem. Shoot me a message at waltonpacfundraising@gmail.com or if it's a question about how Chimp works, have a chat with them.